Students and faculty thrive when given the appropriate tools and environments to work, study, and create. A Harkness table or Smartboard can transform a classroom. Access to the latest technology can enhance the learning experience, foster creativity, and allow students to perform cutting-edge scientific experiments. Our welcoming 40-acre campus, sustained through the endowment, includes seven major academic buildings, a nurturing Lower School, two libraries, comprehensive athletic facilities, a chapel and custom-built pipe organ, a fine arts center, and a 75,000 square foot state-of-the art science center and planetarium, which is scheduled to open in fall 2019. The forethought of our leadership and the generosity of our community has provided the freedom for our boys to pursue their interests, our athletes and coaches to train for competition, and our faculty to expand their teaching beyond the classrooms. A. Strengthen and expand science and technology education through the construction of the Winn Science Center and the renovation of the McDermott-Green Physical Science Center. Use new facilities, including the planetarium, greenhouse, and maker space, to inspire innovative research, instruction, and learning. Expand interest and participation in all STEM-related fields by leveraging the use of cutting edge laboratories, engineering facilities, and research spaces. Strengthen Lower School science opportunities to include specialized instruction for boys in grades 1 through 4. Promote increased faculty and student collaboration to facilitate individual and group learning through intentional use of newly designed common spaces. B. Examine programs and space use regularly to optimize long-term facility needs. Use the ISAS Self-Study for 2017-2018 to assess program and facility needs. Develop a long-term plan for the renovation of space to support identified program needs. Address the space needs for fine arts and the library within the next five years. C. Maintain a physical plant that is in excellent condition and that serves the needs of all programs. Assess regularly the condition of all campus facilities. Review sustaining fund policies and ensure that sufficient funds are available for both new and existing buildings. 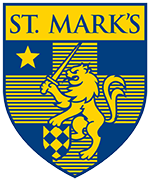 Evaluate and update campus aesthetics periodically to provide spaces that inspire the St. Mark’s community. Provide daily lunches that are healthy, nutritious, and widely appealing. Regularly assess and update campus security personnel, programs, and resources. Revise and strengthen the crisis management plan to increase preparedness. E. Expand technology infrastructure and tools to enhance teaching and learning opportunities for faculty and students. Develop a long-range plan for technology use across campus. Ensure that each faculty and staff member has suitably equipped facilities to meet programmatic needs. Perform an annual inventory of software and hardware needs and develop a strategy for updating resources regularly. The students in Doug Rummel’s senior Information Engineering course have an ambitious goal: to build a smart robot. 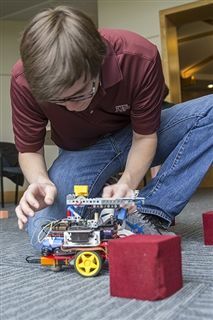 The class combines computer programming with electrical engineering to create robots and devices capable of complex data analysis and other data-intensive procedures. Their goal is to design a robot that will be impressive for not only a high school course but one that can also hold its own when compared to those made by college students at top-tier universities. The Winn Science Center, scheduled for completion in 2019, will offer myriad opportunities for students to advance their academic knowledge and hands-on experience. The maker space, computer science lab, 3D printers, and many other resources will give students more tools to build the next generation of robotics.